Cristián Ferrar, a brilliant and handsome Spanish émigré, is a lawyer in the Paris office of a prestigious international law firm. Ferrar is approached by the embassy of the Spanish Republic and asked to help a clandestine agency trying desperately to supply weapons to the Republic's beleaguered army -- an effort that puts his life at risk in the battle against fascism. Joining Ferrar in this mission is a group of unlikely men and women: idealists and gangsters, arms traders and aristocrats and spies. From shady Paris nightclubs to white-shoe New York law firms, from brothels in Istanbul to the dockyards of Poland, Ferrar and his allies battle the secret agents of Hitler and Franco. And what allies they are: there's Max de Lyon, a former arms merchant now hunted by the Gestapo; the Marquesa Maria Cristina, a beautiful aristocrat with a taste for danger; and the Macedonian Stavros, who grew up “fighting Bulgarian bandits. After that, being a gangster was easy.” Then there is Eileen Moore, the American woman Ferrar could never forget. 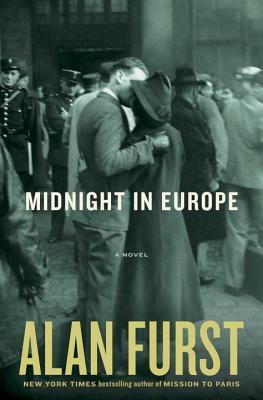 In Midnight in Europe, Alan Furst paints a spellbinding portrait of a continent marching into a nightmare -- and the heroes and heroines who fought back against the darkness.